It’s a common misconception that only the elderly or the very wealthy need an estate plan. The reality is, this couldn’t be any further from the truth. While nobody likes to think about a future without them in it, it’s important to proactively create a plan for your estate to not only direct the distribution of your assets, but also to protect your family, should something unexpected happen. At RAA, we consider your estate plan to be a key factor in your financial security, and our team of experts can help you build an estate plan based on your unique needs and life circumstances – whether you are just starting your career or a family, or are enjoying the retirement of your dreams. For those in the early or mid-stages of their careers, a common element we focus on is directives for minor children. Do you know what would happen to your children if you and your spouse suddenly passed away or were unable to care for them? Too often, parents’ wishes for the care of their children are not clearly laid out in the proper documents, and these decisions end up in the hands of the court, causing an undue emotional toll. We can help advise you on which documents are needed to make sure you and your family are covered, whatever comes your way. Once in retirement, your estate plan will focus more on the future of your legacy. We can help you account for questions including: How will your assets be distributed? Are there any special considerations regarding your beneficiaries that should be included in your directives? While we are not attorneys, our team can work with you to review your estate planning documents and recommend updates based on your changing needs. No matter what stage of your life and career you are currently in, our team can work with you to create an estate plan that encompasses what’s important to you and that will ensure your wishes are carried out. We understand that your wishes can change over time, so your plan will be reviewed regularly and updated if necessary to reflect your evolving life. You deserve the peace of mind that comes with knowing your legacy and loved ones are protected for years to come. 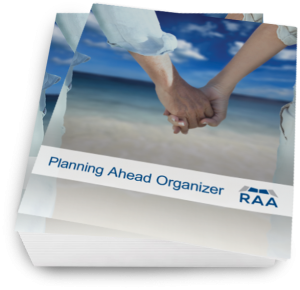 RAA has developed a guide to help you, your spouse and family sit down and plan for the transition of running your household should one of you become incapacitated or pass away. There are many publications that provide assistance once you become a widow or widower, but it is hard to find help on preparing for that eventuality. We want to help ease the burden of the surviving spouse and family members.